Ready for a nap, young Fred the Basset Hound goes to his room after an energetic morning of play and the unthinkable happens: his favorite comfy, red bed has disappeared! After a search of his house that involved an exchange with a less than helpful mouse, Fred sets out on a journey outside to find his bed. Along the way he meets a sedentary frog, an enthusiastic cricket, and a sympathetic owl. The dilemma of his lost bed intensifies as Fred realizes he has strayed too far from home without telling his father that he left. A Bed for Fred is a delightful journey relatable to young children, figuring out the world they live in as well as their first experiences with complication and change. 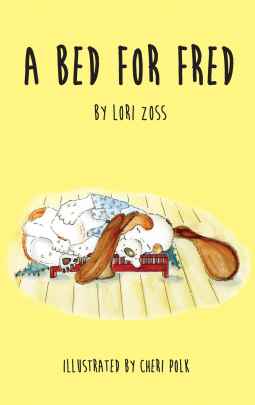 Review: A Bed for Fred by Lori Zoss is a cute story that will surely please your children. My child was delighted with all the animals Fred met along the way in his search. The story brings out many questions from your child as you turn the pages. A Bed for Fred is an inviting read. Me and my child enjoyed it via a Kindle. Note to Parents: Due to the length of this story, I recommend this story for ages 4 and up. At first glance I thought it might be too long for a child of 5. Yet, as we went along, my child’s attention was kept captivated until the end. Publisher: Hugo House Publishers, Ltd.